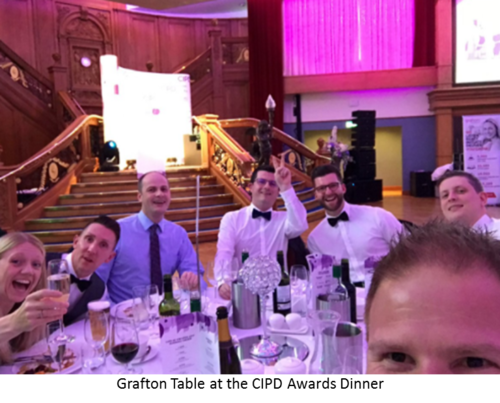 The CIPD NI Awards 2017 returned to Titanic Belfast this year, a flagship event in the CIPD annual calendar, celebrating accomplishments within Human Resources in Northern Ireland. The event is very much an opportunity to recognise success within the Human Resources industry in Northern Ireland, not only individual, but team and organisational achievements, paying tribute to the contribution HR makes to the overall commercial direction of an organisation. Grafton were pleased to be the Headline Sponsor this year, an event we are immensely proud to be associated with. We hosted a table on the night and were delighted that a number of our prestigious clients could come along to enjoy the evenings festivities. It was great to see so many new businesses making the shortlist this year, emphasising the growing significance of the CIPD Awards in Northern Ireland. Grafton decided to put forward an application last year for the very first time and we were delighted to win an award for the “Most Effective Recruitment Strategy”. The impact this has had on employee engagement within the Grafton business, as a direct result, has been significant. Recognising and reflecting on success is so important to the continued development of an organisation at all levels; therefore, I would urge any organisations thinking about entering next year to do it, regardless of the outcome. My personal experience of recruiting within the HR market in Northern Ireland has seen a massive focus placed on continued professional development within HR, further emphasising the importance of the CIPD qualification within the Northern Irish market. I firmly believe this provides HR job seekers with a solid educational platform, ensuring they can confidently implement people strategies, develop effective business partnering with key business leaders and ultimately contribute to the overall business as a valued member of the organisation. Business Partnering was a key talking point on the night, highlighting the increased emphasis on business partnering within the HR industry. HR professionals are playing an increasingly significant role in shaping organisations in Northern Ireland, liaising with key stakeholders to ensure the business strategy and the people strategy are well aligned, giving the business the best chance of sustained success. As massive thanks to Lynn Carson and the rest of the CIPD committee members for putting on another fantastic evening and massive congratulations to all the winners!